Apparently nobody really likes candy corn. Except for me and my dad I guess. At the grocery store I heard people talking about how awful it was before placing a bag into their cart. What the ever-loving heck? If nobody bought it they wouldn’t make it. You know, supply and demand and all. This little grocery store tete-a-tete was definitely a head scratcher for me. I don’t buy anything I don’t like. Ever. Period. At any rate I often take epsom salt baths to help with my health. And I recently learned that if I used epsom salts with lavender in them that I’d have even more health benefits and feel even better. Now they do sell bath salts that already have this little extra additive but I had everything else on hand so I didn’t see why I shouldn’t just mix up my own batch. 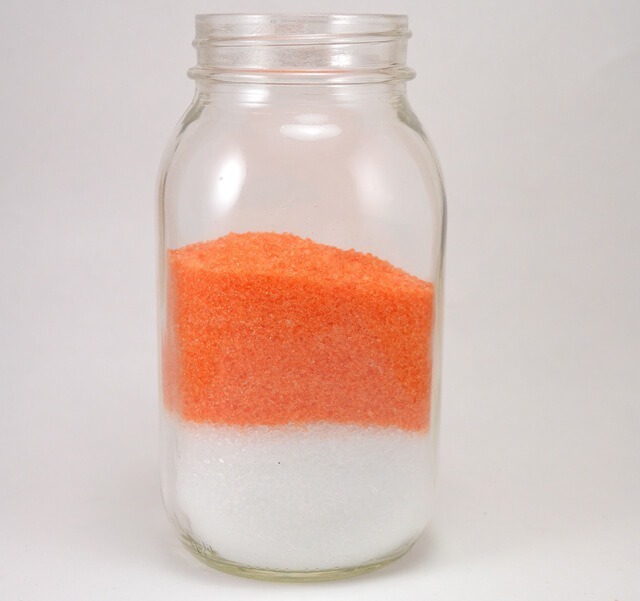 You may be wondering how in the world am I going to guess just how much epsom salts I need of each color for a great looking jar? It seemed a head scratcher at first but I finally figured it out. 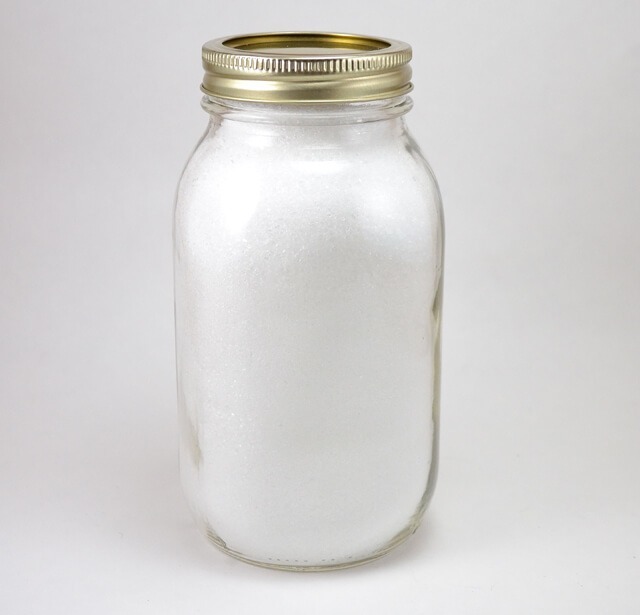 Fill your jar completely with epsom salts straight from the package. 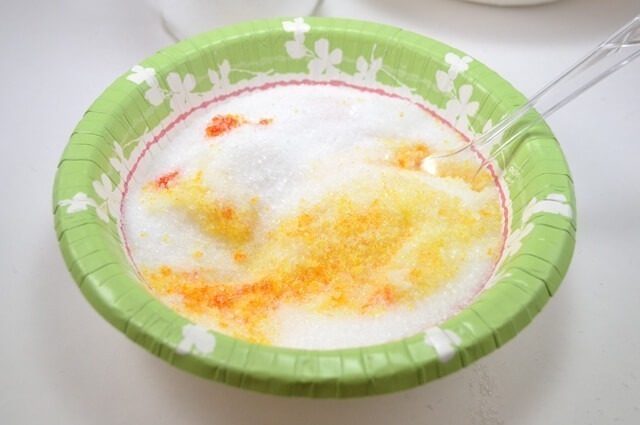 Using something small, equally remove the epsom salt 3 times adding the salt to 3 different bowls. I used a 1/4 cup measuring cup but it doesn’t even need to be that specific. It could even be a shot glass if you’re willing to keep at this for a decent amount of time! 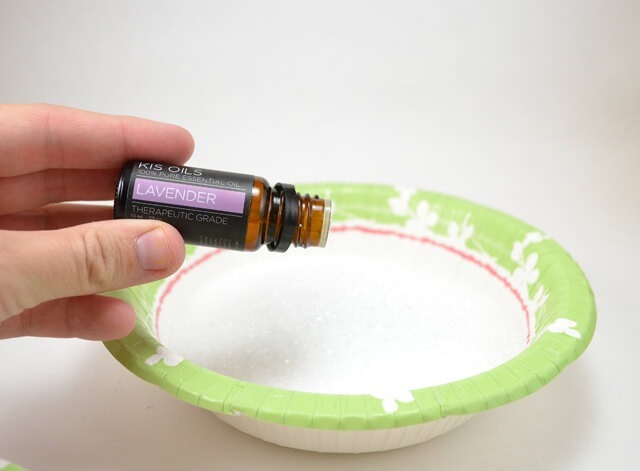 Add lavender essential oil to your three different salty bowls. I did this after measuring out just because I didn’t want to get one larger bowl dirty and there wasn’t enough room in the jar to distribute the oil evenly throughout. I used 10 drops per bowl but go with how much scent/oil you want. Use a fork to work the oil throughout the salt. 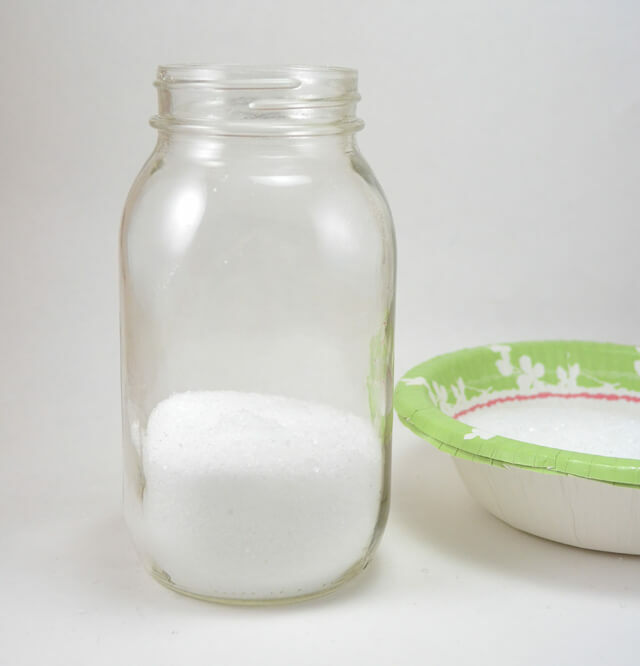 Pour your first, white batch of Epsom salts into the bottom of your jar. 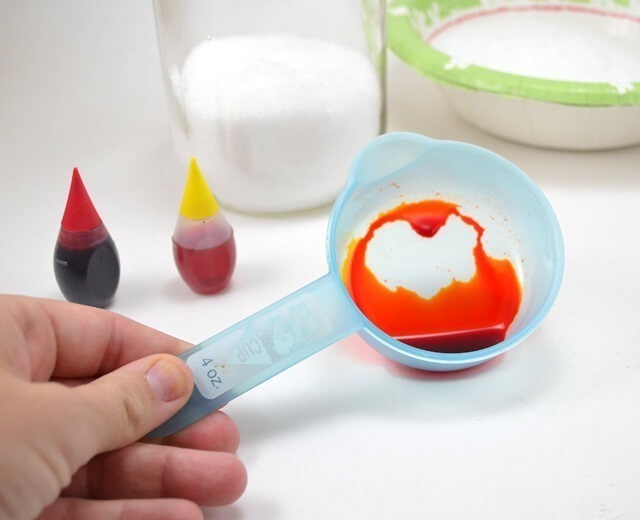 Add yellow food coloring to your next batch and use the fork to spread the color out evenly. Start with a few drops, maybe 6 and then keep working up until you achieve the right color. 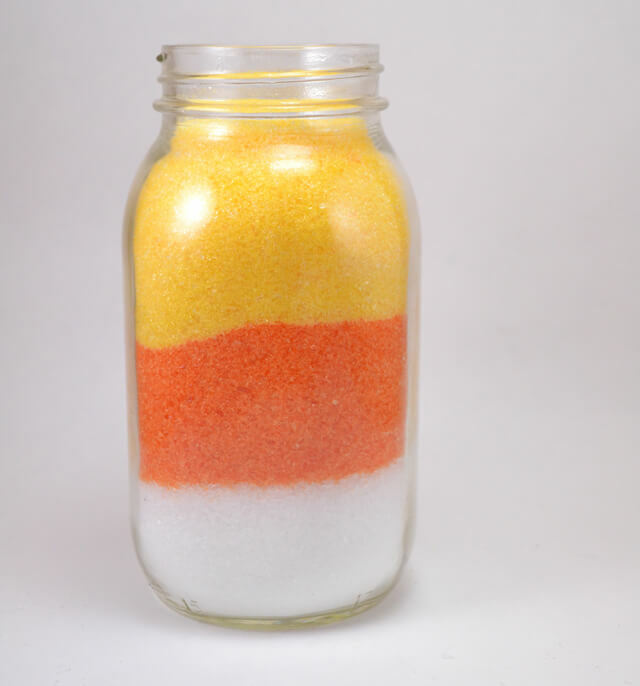 For your last batch we will need to add yellow and red together for a lovely orange color. Use 1 red for every 3 yellow drops to achieve your color. Mix small batches adding to your salt, distributing with your fork, until the desired color is achieved. 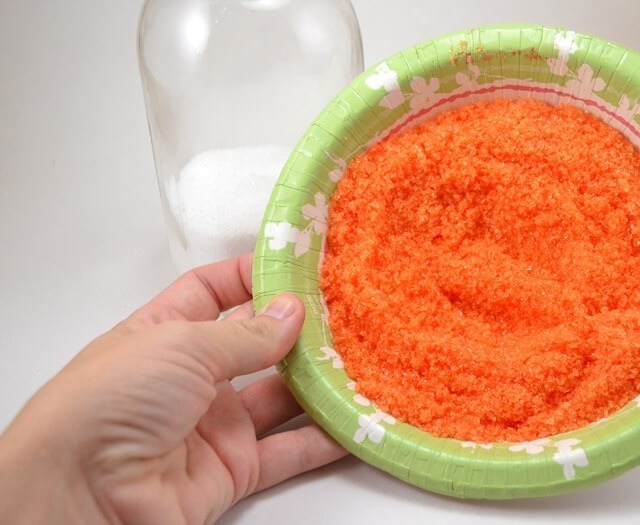 Pour your orange salt into your jar. Tap the jar on the table surface to try and level out the salt inside a bit. 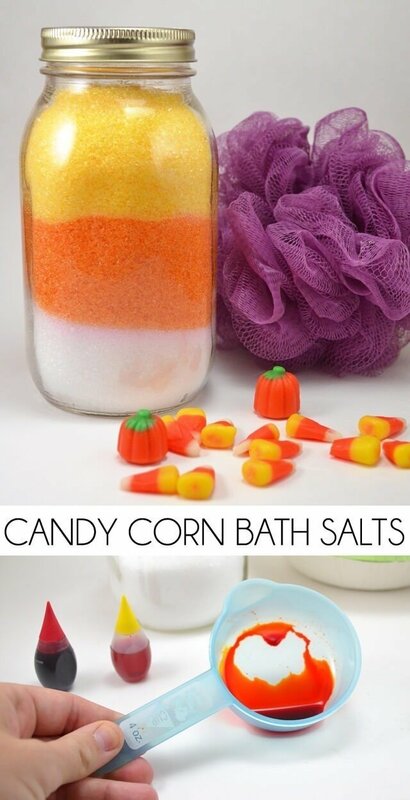 Finish with your yellow salts and you’re rocking the candy corn look! This makes an excellent and inexpensive little gift and can be scented in any way. I also have some lovely pumpkin spice essential oil that smells like Autumn and would be perfect, especially for a gift. 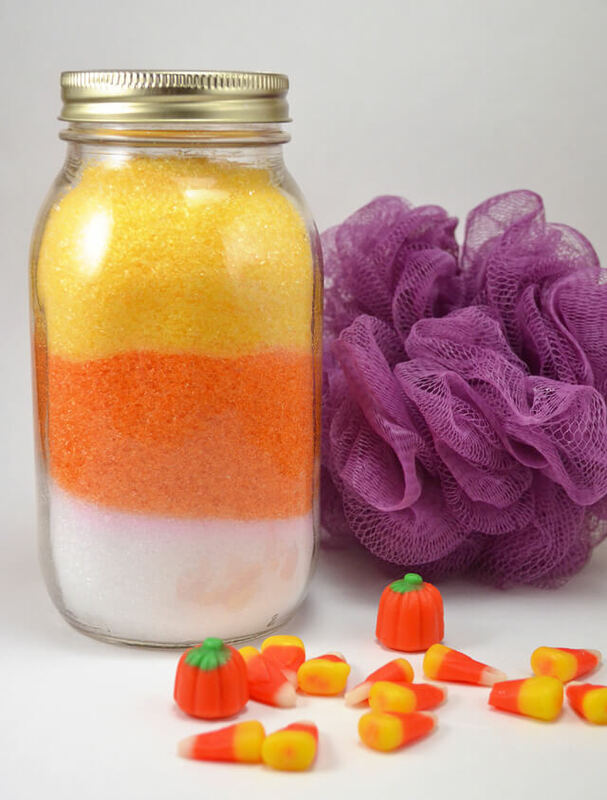 Rather than gifting mine, mine is adding a bit of seasonal pop to my bathroom looking all candy corn cute and being useful at the same time (P.S. this is a HUGE jar!). Make that you, your dad and me Allison. I LOVE candy corn! Its probably the only candy that I will munch on consistently throughout the day. But I hear you about not understanding other people. They are an enigma to me too. I heard a similar conversation the other day at our local peanut shop which sells candy corn. These people were buying it but at the same time, saying how much they hate it. Naturally, this puzzled me. I couldn’t help but think why the heck they’re buying something that they hate? Are people so wasteful that they can afford to buy things they don’t like and then never use? I don’t think I’ll ever be able to figure that one out!